To Shoot RAW or JPEG? I have been shooting photographs regularly for over 7 years now. I spent the first year shooting with a 2 Megapixel phone camera. Since then, however, I’ve almost always had RAW capable cameras and shot RAW compulsively. And why not? I get 16x or 64x more colour depth than JPEGs. I don’t have to bother about setting the right white balance, contrast or sharpness. I don’t have to choose between monochrome and colour at the time of shooting. I can figure all of that out on the computer during RAW conversion and even try out different settings for the same picture at my leisure. Why would I give up all this and shoot JPEG? My gear has evolved from P&S to DSLRs over the last five years, and each year I end up buying a new camera. The focus this year, was on reducing the size and weight of the camera gear, unlike previous years where I had been looking to acquire the latest sensor technology (although I was tempted to swap my D3100 with D3200!). What started out as a quest for cheap backup P&S, ended up as a story about Nikon 1. But not before I had analyzed every single camera in the INR 10k to 25k price bracket. 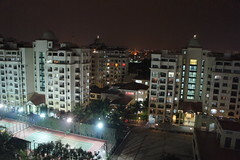 Thanks to Flipkart which has a decent range of cameras. But somehow I resisted the urge to order J1 from Flipkart, and instead went to a Nikon store in Lajpat Nagar, where to my surprise I got a better deal. 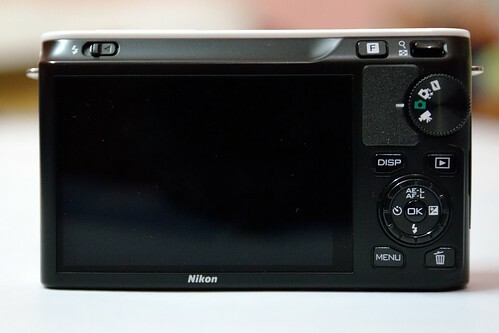 When Nikon launched the 1 series, I was one of those who ridiculed their decision to go for a piddly 1 inch sensor, with a meagre 10MP resolution. More so because of their outrageous pricing of the kits. Perhaps Nikon’s think tank never updated their market study which seems to have been based on the trends prevalent five years ago. Back then, these cameras would have been ground breaking, earth shattering, but things have changed since MFTs hit the market. Pricing has become a sensitive issue, in an already overcrowded CSC market. 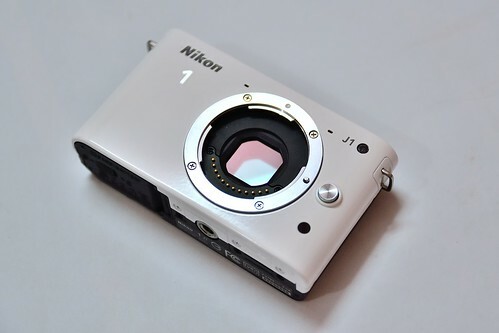 Thankfully Nikon acknowledged this fact, and dropped the price significantly for both its cameras, a move which seemed to work in their favor as J1 (and V1) dominated the CSC markets in Japan and Europe. Prior to buying the J1, I had mostly been carrying my DSLR kit – D3100, Tamron 17-50mm f/2.8 VC, and Nikkor 18-200mm f/3.5-5.6 VR, to my leisure trips and social events. Throw in a battery charger, UV filter and polarizer (both of which fit snugly on either of the lenses), and the kit would weigh two kilograms or thereabout. Those who have carried so much weight to day long sightseeing trips would agree that the dead weight spoils the experience. J1 is light and how! The body weighs in a mere 235g, add a couple of lenses 10-30mm f/3.5-5.6 VR (115g) and 30-110mm f/3.8-5.6 VR (185g ONLY!) and you get a useful range of 18mm – 198mm (DX format) for just 535g. For the sake of comparision, D3100 weighs in a good 455g for body alone and similarly Olympus PEN E-PL1 weighs 335g and has a heavier kit lens by comparision. In hands, the J1 is good to hold, its not feather light and that helps in keeping the hands steady. I have taken it to a few wedding events and it hasnt been a distraction, to say the least. The only gripe that I have is regarding the neck band that Nikon has provided in the kit. It would have made more sense to put a wrist band instead. I didnt even bother to put the otherwise flashy neck band, instead used an old wrist band that came with my Canon Powershot. J1, like V1 has a solid build quality. 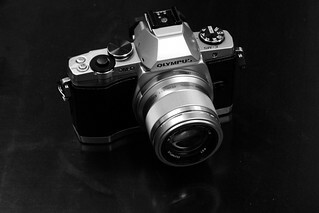 Better than my D3100, and more reminiscent of my old D80. Both lenses have metal mount, and great rubber grip. 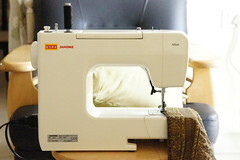 The zoom rings are sufficiently smooth to operate and have no creep. In white avatar, the camera seems unimposing to the subjects, which is particularly good for clicking those natural, life-like photos where the subjects dont consciously pose for the camera. At weddings, I have often received cold stares and unwelcomed looks by the professional photograhers, even when I wasnt obstructing their field of view. Thankfully the J1 makes it easier for me to sneak in and take advantage of their lighting setup without the professionals bothering too much. 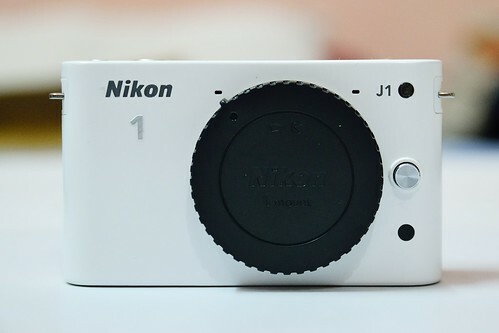 After using it, I labelled Nikon 1 J1 as a curious camera. It is definitely not a DSLR and nor is it a P&S. The UI, button layout and handling are all different. Yes, you find similarities with DSLR when you zoom the lenses, and to P&S when you use the buttons, but there are subtle differences and unique features (like unlock lens to switch on the camera). It takes time to adjust to the new UI (which isnt a bad thing), it kept me engaged for a while before I became familiar with the controls. For example, there is no Fn button to control ISO, but if you exit the “Menu” after adjusting ISO, J1 remembers the last option, so the next time you hit “Menu” you are directly taken to ISO settings. The menu is extensive but intuitive and easy to remember. Not once have I felt that UI has come in my way while setting up the camera for that quick shot. Infact, the camera feels more like a point and shoot, once you set it up properly. I mostly use Shutter priority mode along with Auto ISO, in order to harness the brilliance of the EXPEED 3 technology. The EV comp and ISO settings are fairly easy to reach just incase I want a greater control over the output. 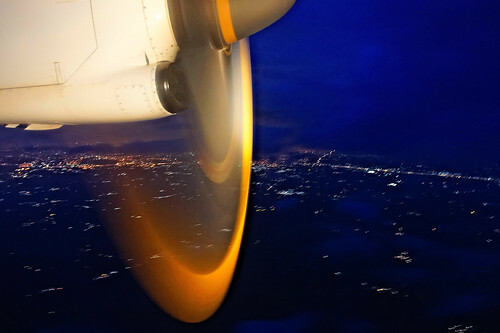 The absence of PSAM dial / shooting modes is inconsequential for me since I hardly use it even on my DSLR. For those shots, where I would like to use manual mode, I would generally have enough time to delve into the menu and change the settings – a fair compromise. 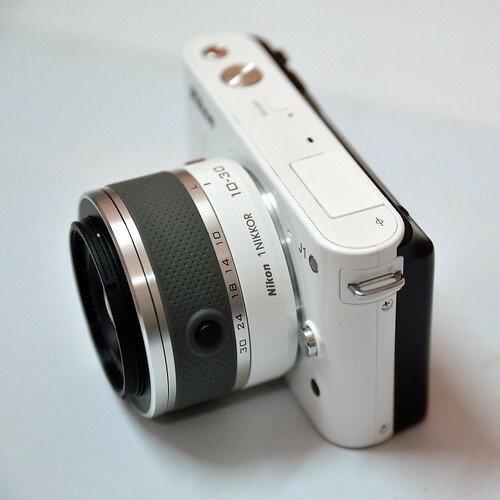 J1’s start up times are fast, and continuous shooting mode is a delight. The metering is brilliant in most situations, and focus is fast enough even in low light. In broad daylight, J1 performs as expected, yes, the auto focus is the fastest that I have seen in this form factor, and dare I say the most accurate, even comparable to D3100. The LCD brightness is good, so much that it can be lowered a bit without affecting legibility, in order to conserve battery. Overall, I have been very pleased with J1’s performance. The JPEGs are generally pleasing with typical Nikon colors, and the RAW output is definitely a notch above the JPEGs. The images are gritty even at base ISO (even when compared to D3100, let alone D7000), but the 1inch sensor captures plenty of details. The sensor size is no excuse for poor low light performance, however J1 fares well in absolute terms, comparable to what I used to get from my old D80. IQ is decent until ISO1600, beyond that things go down hill and require careful processing to get acceptable results. Although 10-30mm kit lens is sharp, it is still the weakest lens in the lineup. Following up with excellent results that I got from the kit lens, I decided to buy 30-110mm f/3.8-5.6 VR and I must say this lens absolutely shines on J1. 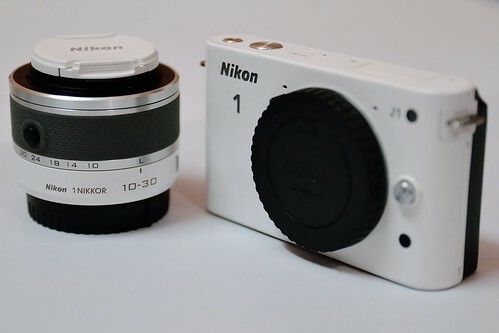 With a complex construction and different coatings, it is a must have for your Nikon 1. The VR works surprisingly well and the images come out sharper than Nikkor 18-200mm VR, and are mostly comparable to Nikkor 70-300mm VR II. Nikon has introduced a slew of lenses which include ultra wide zoom, pancake, fast prime, and travel zooms. The pricing however, remains to be a bit on the high side. I would have preferred the lenses to be atleast 25% cheaper than their DX counterparts. 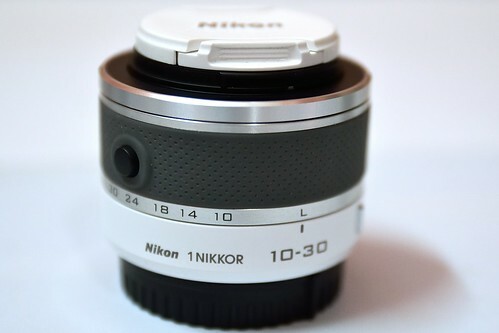 For those who would like to couple their Nikon DSLR glasses with J1 there is a handy FT1 adaptor, however, I have not seen it in action as yet, so I dont know for sure if it taxes the auto focus performance of the DX/FX lenses. On my last run, I have been able to get 350+ shots with VR always on, flash fired on atleast 50 occasions and the battery status still shows 50% usage. Pretty decent. My quest for a back up camera, concluded with me buying a Nikon 1 J1 and replacing my old Nikkor 18-200mm f/3.5-5.6 VR with a shiny 30-110mm f/3.8-5.6 VR. My revised kit now consists of Nikon 1 J1, 10-30mm VR, 30-110mm VR along with Nikon D3100, Tamron 17-50mm f/2.8 VC. With J1 taking a more active role of a pocket sized tele-shooter, and not just being a sidekick to D3100. It’s been a week since I’ve had my baby camera, i.e. 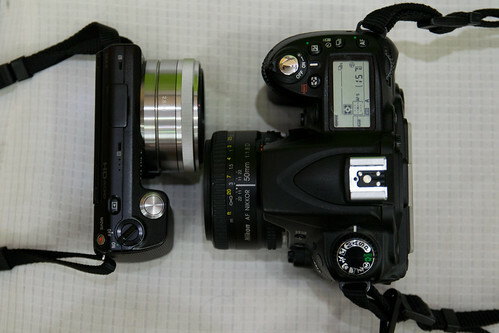 the Sony α NEX-5 and I’ve been enjoying it so far. Here’s a quick low down of the ups and downs I’ve encountered with the camera. Auto HDR and Hand-held Twilight Modes really work! Sweep Panorama works really well for hand-held shooting. You can’t do better with a DSLR until you mount it on a tripod. Movie making is super easy and fun! I’ll probably add more to this post as I get more familiar with the camera, especially when I start shooting RAW (+JPEG, of course).